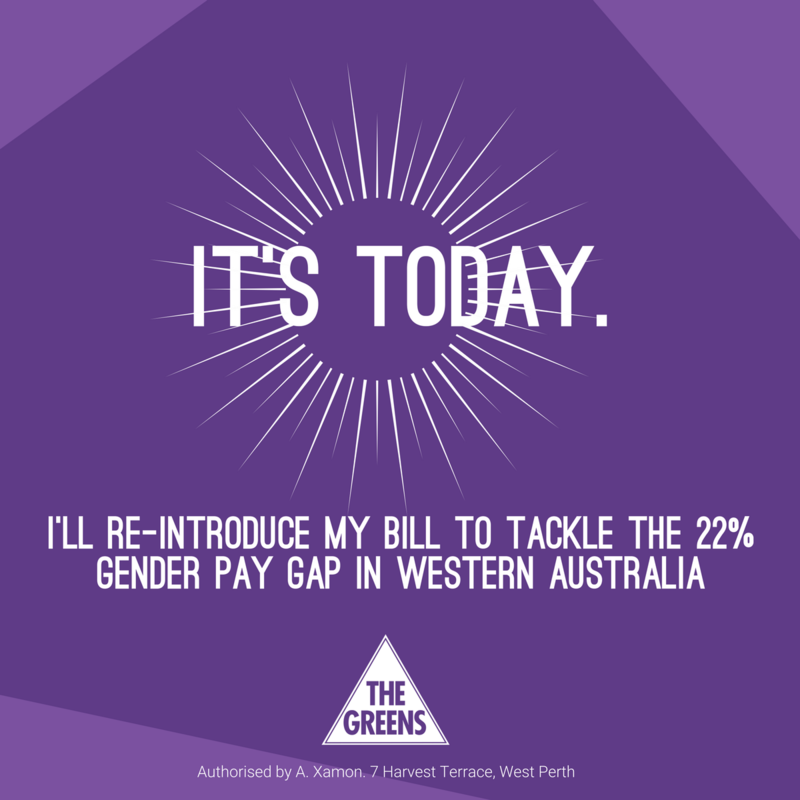 Greens spokesperson for Industrial Relations and Women Hon Alison Xamon MLC will today re-introduce a Bill to Parliament designed to tackle the appalling 22% gender pay gap in Western Australia. Ms Xamon said her Industrial Relations (Equal Remuneration) Amendment Bill 2018 would allow the Western Australian Industrial Relations Commission to hear pay equity cases and to make enforceable equal remuneration orders to ensure employees are able to receive equal pay for work of equal value. She said the bill would create one tool to contribute to reducing the gap, which in Western Australia is about 7% higher than the gap Australia-wide. “Western Australia has the highest pay gap in the country, with women earning 22 per cent less than their male counterparts – this is compared with 15% nationally*,” Ms Xamon said. Ms Xamon said pay inequality was present at all skills and income levels across all industries, with some sectors such as finance and retail having higher than average gender pay gaps. She said pay inequity limited the choices and opportunities for both women and men as it influenced family decisions about who would undertake care and affected superannuation contributions and retirement savings. As well as re-introducing her bill to the Legislative Council today, Ms Xamon said she would call on the Government to re-establish the Pay Equity Unit. “Pay equity is a complex issue that requires a multi-dimensional approach,” Ms Xamon said. Alison first introduced her Industrial Relations (Equal Remuneration) Amendment Bill 2011 on 20 October 2011.